McLaren's Lewis Hamilton has said he will have to re-think how he uses the social networking site Twitter after a series of controversies this year. He wrongly accused team-mate Jenson Button of 'unfollowing' him and a lack of respect, before admitting his error. "Obviously it was not the best of experiences (nor) the best thing to do. 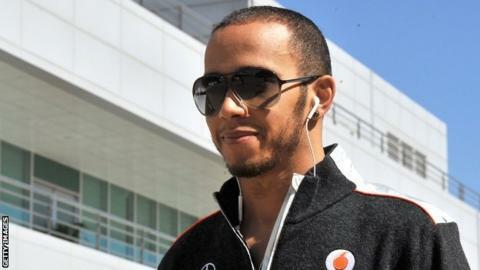 I put my hands up and apologised to Jenson," Hamilton said. "Maybe Twitter is not the one for me, but I'll try and improve from it." Button added: "You have to be careful what you put on Twitter. We've got over a million followers. It is what it is, and Lewis apologised to me." Hamilton wrote on Monday: "Just noticed @jensonbutton unfollowed, that's a shame...I thought we respected one another but clearly he doesn't." Button had never followed Hamilton on Twitter. When he realised his error, Hamilton posted another tweet, saying: "My bad [mistake] just found out Jenson never followed me. Don't blame him!" It was not the first time this season that Hamilton's use of Twitter has caused problems. On the morning of the Belgian Grand Prix, he angered McLaren and Button by posting a photograph of a confidential team telemetry sheet, showing information about his and Button's qualifying laps and other car information. Hamilton said ahead of the Korean Grand Prix on Thursday in reference to the latest controversy: "In my life, I think I'm going to make lots of mistakes and that was one of them but you learn from them. "I try to stay away from all the stories. Sure there's been a lot of heat this week. That's the price you pay for being in this sport. "It was an experience which I'll hopefully learn from. "Maybe Twitter and me don't go too well at the moment. I need to step back and think about how I try and improve that." Hamilton heads into the Korean race 42 points behind championship leader Fernando Alonso of Ferrari, who is four ahead of Red Bull's Sebastian Vettel, the winner of the last race in Japan, where Hamilton finished fifth. Although there are a maximum of only 125 points available, both Alonso and Vettel said they felt Hamilton was very much in with a chance of winning the title. Vettel said: "They are still fighting for the championship. I think that is their target, or has to be their target. "I think if you look at the races we had after the summer break, so far on average, McLaren was the most competitive car. "They are the ones which will be very competitive, no matter where we go, at least that's what the last couple of races showed. They still have a very good chance." Alonso added: "It's more difficult (for him) because now there's not only one driver ahead that you need to take some points off. "We are now two with more or less the same points ahead and he's behind, so for sure the chances for him are a little bit lower. "If we see the form of McLaren and Lewis before Suzuka, there's still plenty of time and plenty of points to do it. I think he still has the possibility." Hamilton added: "[The title is] still up for grabs, [but it is] a little bit tougher for us than Sebastian and Fernando. Still 125 points available and I'm going to try and grab every single one. I'm still in it to win it and I'll keep pushing." McLaren managing director Jonathan Neale added: "We go into this race with better certainty about out car - and some performance upgrades - and we would expect to be on par with the Red Bulls. "It looks like the top three teams still have their foot down in the fight for this championship and are still bringing upgrades so it should be an interesting end to the season."